Hi @RickD. Have you tried setting it up on your server's server configuration interface? If you double-click on your machine's screen name, you should see an option to change the modifier keys. What isn't obvious is how the modifier keys as shown in the config relate to the mac/win keyboard mappings. I tried the suggestion in the knowledge base (https://symless.zendesk.com/hc/en-us/articles/115004722807-How-to-swap-modifier-keys) it didn't work for me. Do you need further help on this @RickD? Yes I need further assistance. I have not solved the original issue. 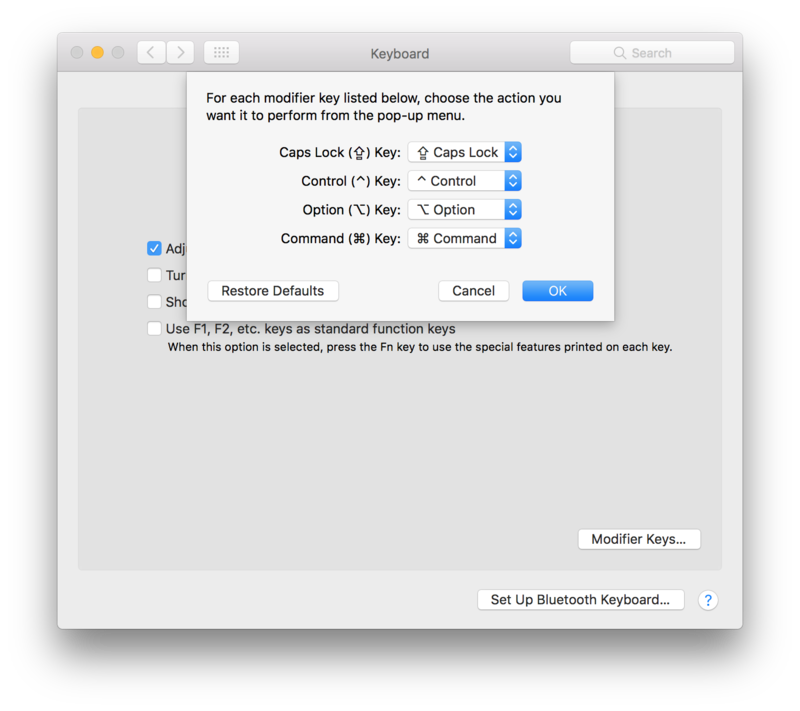 How do I map Windows keyboard keys to Mac Command/Option keys with a Window machine as sever and Macs as clients? The knowledge base information provided is not clear. Which part of the knowledge base article is not clear @RickD? Please explain the relationship between the keys on a Mac or Windows keyboard (Ctl-Command-etc) and the modifier keys. What is the Super Key or alt Key and how do they relate to the keys on a Mac or Windows keyboard? Hi @RickD. I think the information you need can be easily searched online. Here's the links for Wikipedia's definition of each. I'm trying to remap the physical keys that are attached to my primary (Synergy server) machine that is running macOS High Sierra (iMac 27-inch, Late 2013). My secondary machine is an Ubuntu/Linux Laptop (Dell XPS 13 Developer Edition). I do not want to remap the keys directly on my secondary laptop (Ubuntu) settings because the physical (local) key maps should remain consistent and familiar. I only want the keys to be remapped when I'm controlling Ubuntu from the macOS physical keyboard. Please do not respond with advice on how to remap physical keys directly on Ubuntu, I already know how to do this, but do not wish to. I was unable to find links on Symless.com to any documentation whatsoever. I'm certain this is not an unusual request and I'd rather not trigger an individual support ticket that just gets repeated over and over. Hiding the forums behind a "Help" button that looks more like a "Support Ticket" isn't the right way to do this. Please update the website main navigation to include direct links into installation, FAQ or troubleshooting content. I found this forum from external search engine results, and was immediately blocked from searching anonymously by some message that indicated I need to wait 4 seconds before performing another search, but in reality, I was not permitted to search after any amount of waiting until I signed into the forum with my account. Please update this error message to more accurately reflect what's going on. Please consider updating the thread with a new link or at least delete that now-misleading post. I have quit Synergy and restarted it. I have rebooted both computers. I have unchecked and checked the Synergy application in macOS Security and Privacy settings. All to no avail. Double-clicking on machines in the Synergy configuration dialog has no apparent effect on my computer. I have a similar issue. I have a Keyboard that allows me to change the keys from the keyboard itself. So i have set windows key to be command from the keyboard. However, Synergy is automatically mapping the key that it thinks should be Windows to command is reversing the setting I have set on the keyboard. Any suggestions for disabling automatic key-switching? Just in case anyone else runs into this issue with a Windows + Mac configuration, here's how I have mine set up and what it does. Under "Modifier Keys" on the right side of the window, here is what's what. Shift and Control are the same for both. I've attached a screen shot of my setup, here's how the keys line up for me. Left side will be Windows, Right side macOS. Hopefully this helps if anyone is setting this up in the future! That's for the 1.x versions right? @Mohammad Minaie Yes. Do you have same issue with Synergy 2? yes, i do. Mostly because users can't change the key mappings in Synergy 2. I've figured out a solution to this issue for Synergy 2 and will post it in the forum as soon as I document it. This took quite a bit of troubleshooting, and it's a bit of a hack. These settings assume you're using a Windows system as the server, and the Mac system is the client. Stop the Synergy service running in the background. SET synergy.conf THE FILE TO READ ONLY - this is key, since otherwise your changes will get overwritten as soon as the Synergy service restarts. I had it nuke my test files several times before I realized what was happening. I'm going to post this on other related threads to help others as well. Note that if you change your setup later, you're going to have to undo this change (let Synergy edit the file), make the setup changes, and reapply it. * And now for a selfish plug - if you find that this solution saves you time, throw me a follow on Twitch or Instagram (cautionary_snail) - it's free, and follows make me happy since I work hard on my photos, and will be trying to build a Twitch channel soon. If you work for a company that's awesome (hello to any animation companies, 3d printing companies, etc.) and can send a discount or silly postcard my way, that's especially awesome. I'd worship you if you can get me early access to The Outer Worlds so I could get a jumpstart on streaming it! Thanks a bunch for that. I will test and confirm to help support. Hey there Mohammad -- how did it go? Hoping my solution worked for you. This wasn't the solution I thought it was. I thought this was for fixing Parallels not functioning correctly when running on a Synergy Mac Client. I did verify that this manually controlled the key output. I found the solution by going through their Synergy Github repository and experimenting with what was documented as supported for Synergy 1. Perhaps your solution, if it was a feature in Synergy 1, might be found in one of the documentation bits there. I have found via trial and error that not 100% of the featues in Synergy 1 that are controlled by the synergy.conf file do work in Synergy 2, so it may be a little hit or miss. For example, Aliases were a no-go for me, and I have yet to figure out a way to map the Fn key on the Mac keyboard so as to access some of the other Fn+F4/Fn+F5 keystrokes. If I could just figure out if the Fn key sends any form of Unicode, I might have a chance of figuring it out, but that's mysteriously missing from the bulk of documentation I've looked at thus far. Synergy operates as a kind of 'nonkeyboard' on the Mac, so, attempts made to alter configurations for virtual keyboards end up going nowhere. But always keep an eye out for automatic overwriting of changes made by Synergy 2 when the service restarts and set things to read-only. Thanks Iconover. Your solution worked for me! While it's not great that we have to suppress certain features (like future autoconfiguration) to get this to work, at least it's a start. What I still don't quite get is why this has not yet been included in a new build of the actual Synergy 2.0 software since the functionality is present and activating it merely requires adding the strings to that configuration text file. It makes me sad that such a great product is not getting the development support to regain these clearly pre-exisitng features via the UI. Is Symless no longer investing in this product?